Location was good, not far from town, restaurants and the marina for ferry trips. Staff were friendly and helpful. The spa was a nice touch. The small set of apartments was quiet and relaxing (no kids, bonus). The location was great as we came into the port of Airlie. When we arrived the aircon was on and very quiet music was playing. Awesome first impression. Full size fridge with freezer was great. Spa and pool were incredible. Excellent service from friendly staff members , Excellent accommodation , very clean and tidy , very relaxing atmosphere . -Locations. That’s all! We only stayed 1 night there and had to cancelled the rest of our stay!! Don’t waste your money and ruin your holiday ! The staff were friendly and helpful. They also booked taxis for us. Room was cleaned everyday and bed sheets changed daily. With a Jacuzzi on the balcony, it was a pleasure to relax. Great location as its minutes walk to centre. Also if you want to go to an island the marina point is literally in front of you. Great TV and austar. Comfortable bed, and nice cold aircon. Pool was clean and first staff member we dealt with was professional and accomodating. Location was close to the Main Street and lagoon. at Waterfront Whitsunday Retreat - Adults Only This rating is a reflection of how the property compares to the industry standard when it comes to price, facilities and services available. It's based on a self-evaluation by the property. Use this rating to help choose your stay! 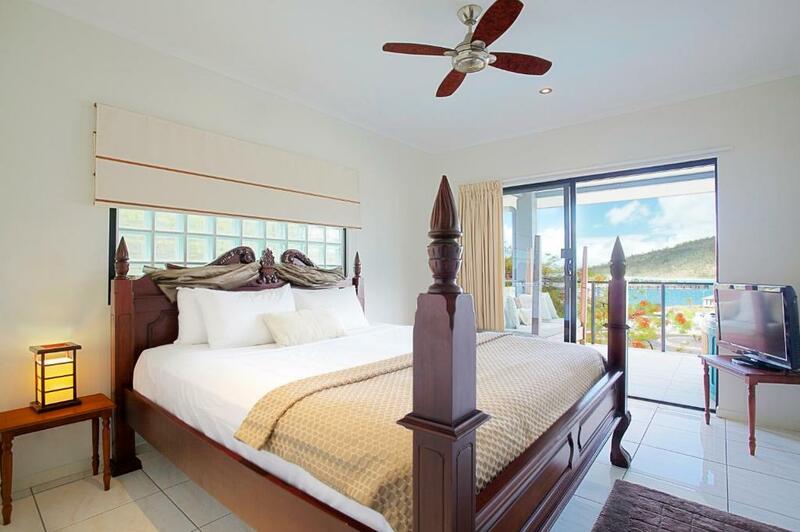 Set on Pioneer Bay, Waterfront Whitsunday Retreat offers deluxe suite and penthouse accommodations with a balcony and free Wi-Fi, just 3 minutes' walk from Airlie Beach. It features a zero-horizon pool and lush tropical gardens. 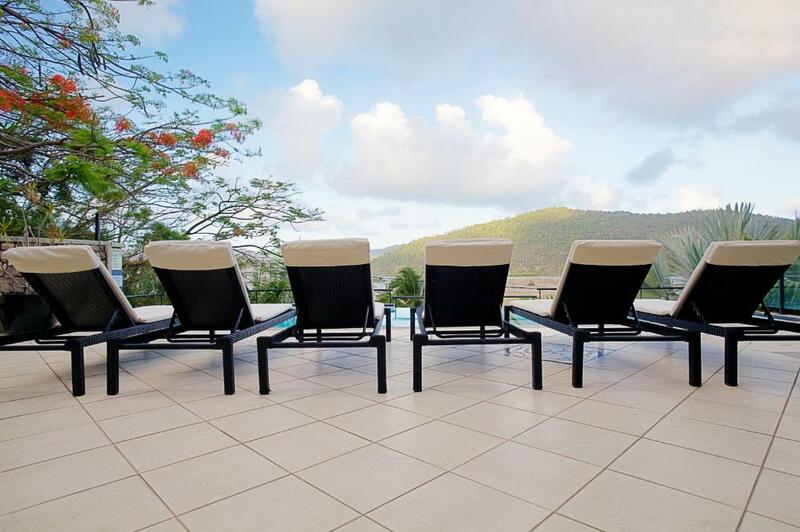 The retreat consists of of 1-bedroom suites and penthouses, with clear views over the Port of Airlie and the Coral Sea. All units have a stylish interior and feature galley kitchens and spacious balconies with a hot tub or spa bath. Penthouses provide 4-poster beds and a separate dressing room with its own balcony. 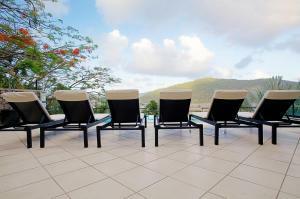 There is a private sun deck as well as a guest BBQ area and native bird-watching opportunities. Guests can enjoy in-room massage and beauty treatments. Waterfront Whitsunday Retreat's tour desk books trips to the Great Barrier Reef. There are limousine transfers to Whitsunday Coast (Proserpine) Airport available. 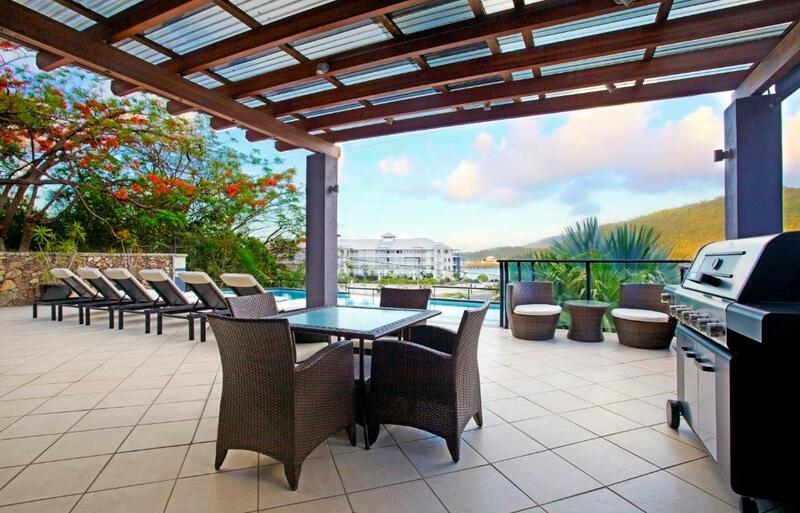 뀐 Located in the top-rated area in Airlie Beach, this property has an excellent location score of 8.1! 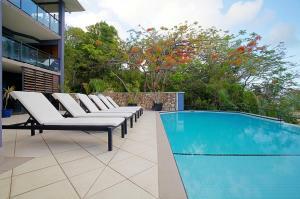 When would you like to stay at at Waterfront Whitsunday Retreat - Adults Only? Features modern interior furnishings, spacious balcony with corner spa bath, full kitchen, private bathroom, 50-inch plasma-screen TV, mini home theater system, 28 cable TV channels, Nintendo Wii game console, iPod dock, and a mini-bar. This penthouse apartment features a 4-poster bed in the master bedroom, a main bathroom with a 2-person rain shower and a spacious powder room, a kitchen, a lounge room with an LCD TV and a home theater system, a dining area, and a large balcony with a 6-person hot tub. Please note that the rate is based on 2 guests. Maximum occupancy is 2 guests. This penthouse apartment features a 4-poster bed in the master bedroom, a main bathroom with a 2-person rain shower and a spacious powder room, a kitchen, a lounge room with LCD TV and a home theater system, a dining area, and a large balcony with a 6-person hot tub. Please note that the rate is based on 6 guests. Maximum occupancy is 8 guests (see Hotel Policies). This penthouse apartment features a 4-poster bed in the master bedroom, a main bathroom with a 2-person rain shower and a spacious powder room, a kitchen, a lounge room with an LCD TV and home theater system, a dining area, and a large balcony with a 6-person hot tub. Please note that the rate is based on 4 guests. Maximum occupancy is 4 guests. Experience the only 18+ boutique accommodation on the Whitsundays Coast. Nestled on Pioneer Bay, adjourning Airlie Beach, you are surrounded by breathtaking rainforest, offering you the highest level of privacy. Consisting of just five, balcony spa suites and an incredible top floor Jacuzzi, with views over Port of Airlie and the Coral Sea, this retreat breathes exclusivity. at Waterfront Whitsunday Retreat offers the travel connoisseur a perfect blend of relaxation, intimacy and personalised service for an unparalleled couples only retreat experience. at Waterfront Whitsunday Retreat sets new standards of relaxation as an award winning couples only boutique accommodation in the Whitsundays. Adjoining Airlie Beach and nestled on Pioneer bay which features pristine turquoise waters surrounded by breathtaking rainforest, guests can expect a high level of privacy coupled with exceptional unobtrusive personalised service. This deluxe retreat comprises an exclusive collection of just five, one bedroom spa suites and an incredible penthouse, with views over Port of Airlie and the Coral Sea. The deluxe spa suites feature contemporary inspired interior furnishings that exude style and tropical ambience, natural timber louvers, spacious balcony with corner spa, gourmet galley kitchen and pebbled ensuite bathrooms. The penthouse features a four posted bed draped with silks, the master bathroom features a double person rain shower, generous powder room complete with private balcony overlooking lush rainforest, a gourmet kitchen, black marble bar complete with wine fridge and stainless steel fixtures. Externally, the penthouse enjoys an expansive balcony complete with a six person Jacuzzi. Whether you're seeking relaxation or adventure, at Waterfront Whitsunday Retreat offers a wealth of diversions. Indulge in a massage, facial and beauty treatment at the resort, or lounge by the swimming pool. For the more active, sail the islands, skydive or enjoy a day at the beach, diving, snorkelling and exploring the reefs. With literally 1000's of exciting tours and unique experiences, the Whitsundays is truly a blissful destination with something for everyone! The at Waterfront Whitsunday Retreat tour booking desk has access to every tour in the region and we can offer you local advice and the best option for your needs. House Rules at Waterfront Whitsunday Retreat - Adults Only takes special requests – add in the next step! Any additional adults are charged AUD 40 per night for extra beds. at Waterfront Whitsunday Retreat - Adults Only accepts these cards and reserves the right to temporarily hold an amount prior to arrival. Please note that guests are required to present a valid credit card upon check-in. A 2% charge applies for payments with American Express credit cards. Please note that children older than 18 years old are welcome. Great location. Nice private room. The cleanliness was not up to standard; mould on wall behind bed, floors not clean throughout. Bathroom floor was quite dirty; as soon as the shower was turned on it was really unclean. Bathroom cabinet was peeling, taps were loose. Outdoor "spa" enamel was peeling and not overly clean, so decided to pass on that too. Photos not like on booking site. Outdoor furniture around pool unusable as ratten was disintergrating. When we mentioned all of this at checkout it was met with "oh, well, sorry about that" (with no real conviction.) A real shame, for an adults only property for this amount I would have expected a little more. Our first trip away without kids in over 10 years so really disappointed. Bathroom was very small, not enough bench space and taps were difficult to operate due to being situated behind a raised bowl. Room was advertised as luxury. Was no where near luxury. Might have been 10years ago but motel very run down & neglected. Spa vent cover was not screwed in, just left hanging. Private balcony not very clean. Bathroom was very outdated needing updating. BBQ area had worn out broken furniture. Also very hard to contact reception after 5pm. We have no complaints about the location or accommodation. Spa did not work. No privacy as the room goes straight onto the pool. So if you want to use the spa on a night everyone can practically see you if they're in the pool. Even during the day we had pool swimmers stare into our room. Room was literally next to laundry so you could here everyone doing their laundry at stupid hours. Room and bathroom could do with updating. Looks modern in areas but also overused. Cars driving by as your located next to the busy road. Not much of a view on bottom floor. Easy access for people not staying. Literally anyone can walk into pool gate then walk onto our balcony area. The gardens beside our door and on our balcony were dramatically overgrown by weeds, making the cure from our balcony quite disappointing. There was a trail of ants all over the wall, window and inside our shower. There were deep scratches over several of the walls in the room. The toilet seat was not screwed down properly onto the toilet and moved around. And the blinds in the accomodation were broken (but admittedly were rectified promptly). For the price we paid there was a lot of issues with the room and did consider moving to another accomodation. The air conditioning unit kept tripping out. There wasn't an oven so restricted to what I could cook, I would have like to heat something to eat. Excellent service , friendly and helpful staff . Great room with a comfy bed and good views .